I had heard good things about this series, and then book 1 got re-published so of course I had to take a look, and I am glad I did. The book is about Xylara, and she is one brave woman. I admired her strength, and courage. She was taken as a warprize, but instead of sitting in a tent being scared she went outside and found the tent with wounded soldiers and got straight to work. She knew what she wanted and that was to help people. The hero in the book is the warlord that crushed all resistance and took over their country (which is a good thing because her brother is a hopeless and bad king, so perhaps it was for the best). Anyway Keir was strong too, protective, and he wanted her, but he also wanted her to want him. He is one barbarian to fall hopelessly in love with. The whole book is told in 1-person, so we always got her thoughts and fears, and it does work. Because this way there is a lot of confusion and fear in the air. I had no idea what a warprize was, neither had she, and I wanted to know. Then when I the reader finally found it, oh I will not tell you, but it sure made the book good. What we have in this book is one strong woman, a feared warlord, and some behind the scenes backstabbing and politics. Some are not happy that the firelanders won and they want revenge. Danger is in the air, from both sides, since there is this one firelander warrior that wants to take over as warlord. The book has a happy ending, even though there is a book 2 and 3. I was glad for this because I just wanted happiness. 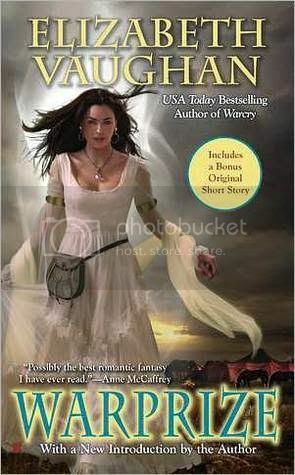 A good fantasy romance, I would recommend this book to others, and I do want to read book 2 and 3. It has so much to offer, a good couple, great side characters, and interesting world, and a story that will have you turning page after page top find out more. I enjoyed it, a quick read. I love the dramatic cover! I agree about the cover- it's stunning! I like th fact that the female protagonist is portrayed as a strong woman. Is it wrong to really want the dress on the cover of the book!! The cover is gorgeous. Xylara sounds like an amazing woman and I'm glad there's a happy ending. I hope there is much more fantasy than romance in this one...I also agree with Vivienne - the dress is lovely! I've been wanting to read this series for long time. And now I'm dying to know what a warprize is. Thanks for the review and recommendation, Blodeuedd! This actually sounds like one I would read and I really like the cover! Hmm I have read about this series before, and it does appeal to me. Nice review, and a good cover. I like when there's a nice ending despite there being additional books in the series:) I adore a strong heroine too, so this sounds like a great read! I just read an m/m romance that had sort of this same theme (the guy ended up a warprize for a warlord). Now I'm wondering what a warprize is. Sometimes always reading from two persepectives gets a little tiring for me so I like that we only get Xylara's pov. Okay, with a guy who could just have her w/o consequences but yet wants her to want him. Oh yea... I could like that warlord. Oh and having such a strong woman? Yep... you have me wanting to read this book. The cover really makes me want to read this fantasy! Great review! Sounds like a good book. Love that cover! I had the older version of this one once upon a time but never read it. Sounds like the barbarian is a cutie! Xylara sounds very noble, brave and kind. What a nice surprise to read a republished book and find such a strong character and sweeping romance. And yes, the cover is breathtaking. I read this trilogy when it first came out and loved it. Don't know why I didn't read any of her other books though. I like the cover too. Xylara sounds like a great heroine.